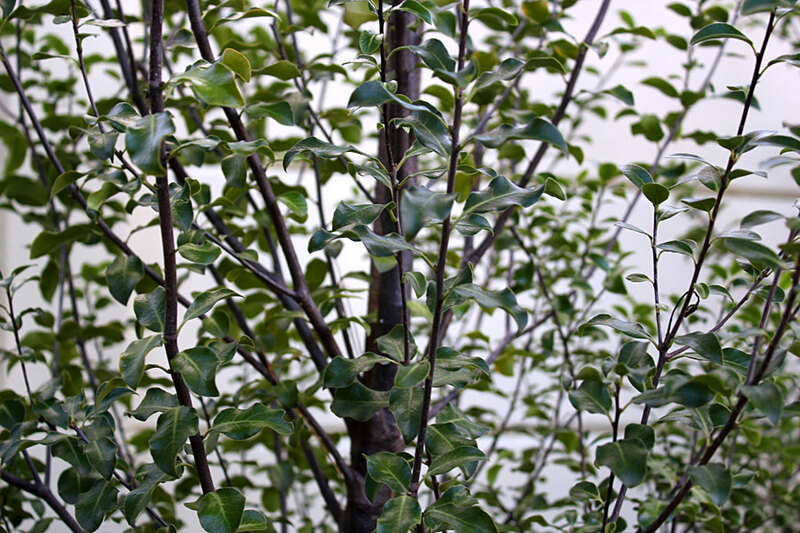 Yesterday I showed my new shrubs / trees, the three Pittosporums, which I’ve planted as screening in our back garden. Diana of Elephants Eye, my Blotanical Mentor and ‘Mom’ to Lady Aragon and M’sieur Chocolat, (go look, they are tooo cute!) asked me a question that I could not answer so I promised a follow up post. Usually these types of posts force me to research and learn something new and I come away every so slightly wiser (one hopes). 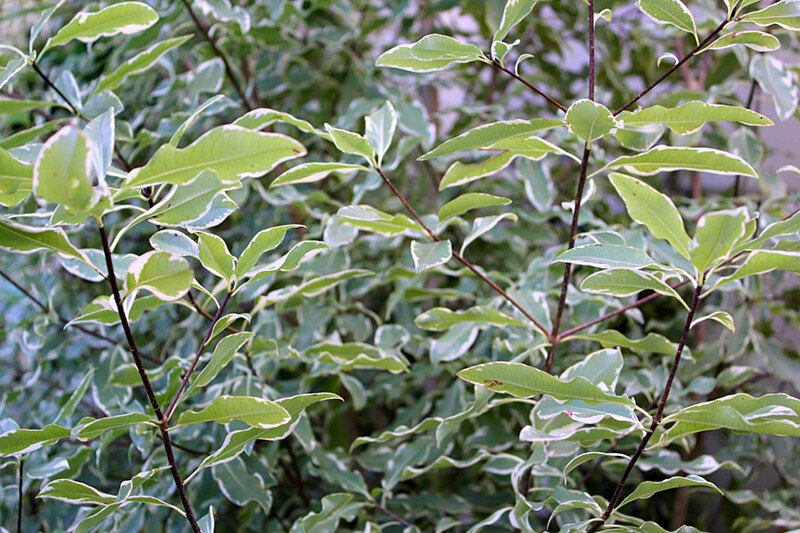 Here’s the thing … when I was in Elgin a few weeks ago I saw three trees planted alongside each other that I loved and the owner told me they were “Pittosporum nigrescens”. I came home and looked them up, never actually found them – but what I did find was various types of Pittosporum and thought no more of it. 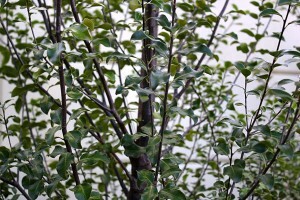 When it came to actually buying the trees I was happy to find them listed as “Pittosporum nigrescens 2.5 – 2.8″ at my preferred tree nursery and after an e-mail establishing that the price was great I had three delivered. On arrival, they were the exact trees I was expecting. But then why do searches on Google not return what I now have growing in my back garden? More searching today reveals the actual name as Pittosporum tenuifolium, var. nigricans, with a foot note saying Name in the Camden Park Record: Pittosporum nigrescens. Having discovered all that, doing searches for those names still doesn’t really bring up exactly what I have, certainly not in the size and beauty of what I saw in Elgin. But here are my photos taken today (apologies for the poor quality / appalling lighting – it’s been pouring with rain all day and I ran out between down-pours to get these shots). These are specially for you Diana and to answer your question, here is what I found … “‘Nigricans’ has black twigs“. or do we call it nigricans? Who cares what they are officially called … I love them just as they are. Isn’t the foliage lovely? 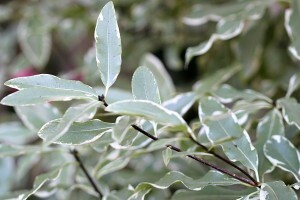 Here are photos of the existing Pittosporum I had, the Pittosporum eugenioides ‘Variegata’. Isn’t that foliage lovely? What is your favourite screening tree? Ooooo – Alan has just chosen my favourite screening plant – bamboo. I wonder if I could grow bamboo in my hard clay soil with dry, intense summer sun. 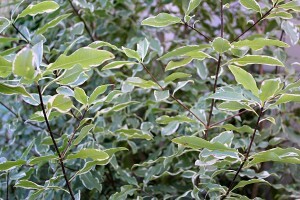 The more I look at the Pittosporum, the more I really like it. I will have to say that it could be one of the trees I will add to my Gardening Journal Shopping list. But first, I must get an apple tree! 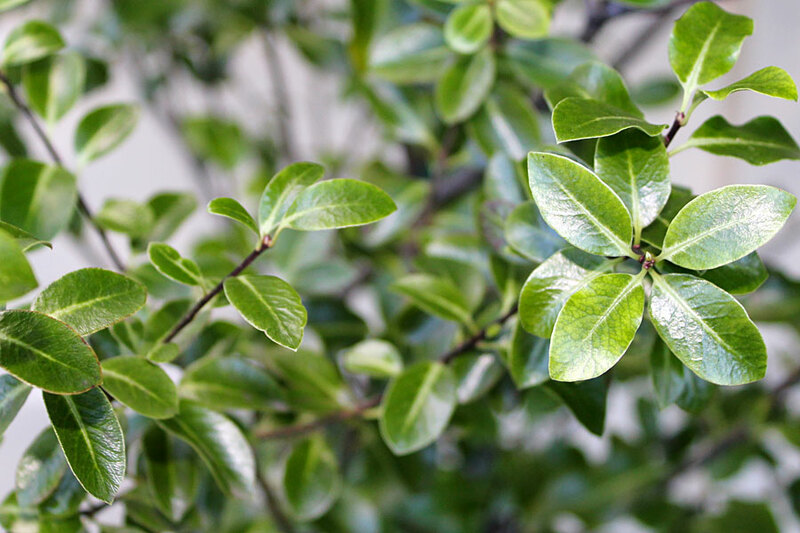 I thought I mentioned that in my comment to your previous post, but maybe I didn’t – they are called black stem pittosporum around here – they are great, airy and graceful, and a good screen plant. Not only do they have black stems, they have black flowers and then greyish fruit – very unusual! Hi, I love the Black Stem Pittosporum, I have one tree in the back, I want to use them as a screen on my back fence, how close did you plant yours? The one I have only grew about 5″ in a year. I want to plant them close, but my husband thinks they should be further away. At 5″ a year it will take a long time to get to close. You have managed to bring out the beauty of the foliage in the plants. I too have encountered many frustrations searching for plants names, including those wildflowers that grow in my backyard. The feeling of ‘bingo!’ when you find the correct name is truly satisfying. hi Autumn Belle, I totally agree! very satisfying when you find the right plant, right name and it all clicks into place. I’m relieved to hear I’m not the only one who can’t find everything all the time. I thought it was purely rookie searching. I like Arbs. They give privacy taking up little space. Plus they house a lot of birds and give shelter in winter. Great wind breaks and noise buffers too. Now that I’ve seen a close-up of your new trees, I like them even more! My favorite screening tree isn’t a tree. It’s bamboo. So I didn’t really answer your question, did I? We screen with a ‘hedge’ of indigenous shrubs and trees, packed together as they would be, growing in a forest. First they cover the washing lines, the jungle gym (the caravan has gone away), now they are climbing the mountain. Oh dear, what does that say about me?